I’ve been on a rosemary kick lately, mostly because I read a bunch of articles that indicated that I should probably enjoy my rosemary plant now because it’s not likely to survive the winter. Bummer. Should’ve planted it in a pot, but darn it, I like having it in the ground next to my kitchen door! Anyway, my Crucial Porthole Infuser arrived the other day (yay!) and I decided that my first infusion would be a lime pineapple rosemary infused tequila. 1. Slice fresh limes and pineapples thinly. 2. Cut a sprig of rosemary. 3. 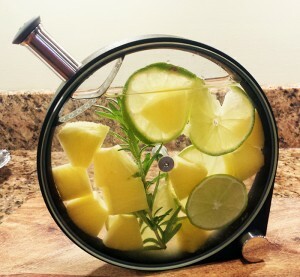 Place the rosemary, lime slices, and pineapple pieces in the infuser (note that you don’t need a fancy infuser like mine—mine is a gorgeous centerpiece, but you can just as easily make this in a mason jar). Close infuser and pour in tequila. 4. Wait, then drink. This is a short-term infusion, so I recommend that you sample your creation at 20 minutes, 30 minutes, 60 minutes, and 90 minutes, and filter and decant the tequila when it’s at the level of fruitiness you desire. At 60 minutes, my husband loved the flavors. At 90 minutes, it was too fruity for him, but delicious for me. This is a tip I learned a year ago from my brother-in-law, who is a former ace bartender: always use fresh ingredients when you’re in the kitchen. I saved bottled juices and canned fruits for baking (sometimes) and cleaning (always). Unlike some of my longer-term infusions, this one is quick and easy to customize. If it’s not flavorful enough for you…wait a few more minutes. I’m not a huge tequila drinker, at least not like this. I’ve saved a couple of little bottles of this infusion to use in a margarita or…something in the future. 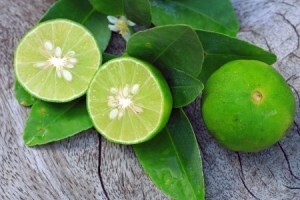 Cut the lime into slices. Cut the pineapple into slices and/or chunks. Place lime slices, pineapple pieces, and rosemary sprig into infuser or mason jar. Pour tequila over fruit and rosemary and allow to infuse for 20-90 minutes, tasting every 20-30 minutes. When the flavor is infused to the point where you want it, filter the tequila using a nut bag (or your infuser filter) and bottle.